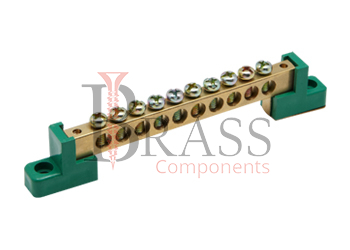 Pluggable Terminal Blocks are manufactured from Nickle Plated Brass, Copper, Steel, Stainless Steel, Aluminium, Polyamide, Polymer or other material composition as per custom specification. Pluggable Terminal Blocks are also available with screws or without screws to tighten properly and for under or over torqueing. Pluggable Terminal blocks are protected by excellent high temperature insulating housing. Allow faster wiring and installation. Also available in a unique push-in-design for connecting wires to the terminal blocks. Offer high density wiring and feature a pluggable function which allow more versatile application. Corrosion Resistance and Impact Resistance. Large Surface area for better connectivity and installation. Provide time and cost-saving system wiring during production, assembly, operation and maintenance. Available in variety of sizes, ratings, finishing and configuration. Ideal for system wiring especially in switchgear and control application. Ideal for application which require high reliable interconnection with the flexibility of simplified modification and installation. For connecting wires to the terminal blocks. We manufacture Pluggable Terminal Blocks as per Custom Specification and export in France, Italy, Switzerland, Poland, Greece, UK and other European Countries. For more Information, Please Contact Us or Inquiry Now.